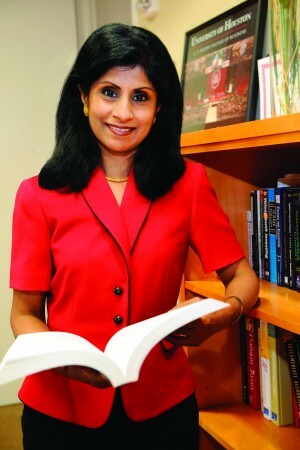 UH Bauer associate dean Latha Ramchand will offer an economic outlook for the new year at the February meeting of the Greater Tomball Area Chamber of Commerce. University of Houston C. T. Bauer College of Business associate dean and finance professor Latha Ramchand will address the Greater Tomball Area Chamber of Commerce (GTACC) on April 1 at its First Friday Networking Luncheon. Ramchand will offer an overview of the U.S. economy and its global context in her presentation, “Looking Back, Looking Forward: What 2011 May Have in Store.” She will also focus on the Texas and greater Houston economies as well as the employment outlook for the area. Each year, GTACC features a speaker focusing on the annual economic outlook at its luncheon, which will begin this year at 11:30 a.m. at the Elmer L. Beckendorf Conference Center on the Lone Star College – Tomball campus (30555 Tomball Parkway). Registration for this event is open to the public. Originally scheduled for February, Ramchand’s presentation was rescheduled for April 1 due to inclement weather. For tickets or more information, visit www.tomballchamber.org.